I often do. It's pretty mean really because the PR element often detracts from the fact that the product being featured is actually...quite good. It's a difficult balance and if you are a cynic like me, often weighs negatively. Well months ago Pantene Pro-V Aqua Light was doing the rounds and it got a good reception. Some liked it, and some loved it - evangelising about how clean and fresh it made their hair feel. At the time - perhaps because this market is always so heavily saturated with new products - I digitally "walked on by"....I was semi-intrigued but not enough to buy it. Cut to this month and blimey - sometimes you have to give bloggers a little more credit. I bought this with my own cash and I can say that I love it. And here's why. It's because this duo leaves my hair smooth and therefore capable of going without heat. That means it dries sans-frizz and at the very most I need a medium-low meeting with the curling iron/straighteners. For me this is all that matters. It cuts down time and cuts down heat exposure - the very thing that killed my hair before, forcing me to chop it all off. I have used other products in the past that also create the same end result - but often for a greater cost, or from brands that are not as accessible. I like the price tag and I like that I can stroll into any Boots/Superdrug - heck, even Tesco/Sainsburys/Waitrose in the country and get my hands on it. What is your current favourite shampoo/conditioner duo?! Oooh I tried this product before and it made my hair fly-away after a while - but then again I do have fine hair anyway. At the moment I'm using John Freida's Root Awakening range. The leave in spray makes your scalp tingle - which I like :) Next on my list is Waitrose eucalyptus shampoo which smelt even stronger so I am hoping for max tingle sensation! As the root of all evil that it's not even on my radar! @Silec - thats fantastic :) glad you found it too! @Daisychain - haha fair enough :) Aveda Shampure smells DIVINE but sadly makes me super frizzy...dammit! Got to say I love my herbal essences for curly hair - no frizz, smells good & cheap. I chopped off my hair 2-3 years ago due to heat damage and have grown it back (and a lot longer) using drugstore products. I wouldnt believe all the hype on expensive shampoos & conditioners. I really liked Tresemme's Naturals collection and that gave my hair really great sheen and feel. Unfortunately, I don't think this product is available in the US yet. It's not listed on their US website. =( Also, I like the bottle. I've definitely heard mixed reviews about this, though used to love Pantene myself. Stories of hair loss and weighing down your locks. I am a big Pantene fan and love this range, it leaves my cheveux light and soft, not frizzy (which is amazing because in the humidity my straight shoulder length hair transforms itself into a perm circa 1988 Melanie Griffith Working Girl). I love cheaper shampoos & conditioners and I don't remember the last time I paid full price for them, I make sure I stock up on the 3 for 2 offers or 2 for €4 or whatever happens to be the bargain at the time. At the moment all I can use is Racoon shampoo & conditioner. Uh no, not for me. I have really bad long-time experiences with Pnatene after using it for a few years. I didn't get the silicone-warnings at first, cause my hair looked great, but after three or four years it got really bad. My scalp was a mess and my hair really weigt down. So I'm using siliconefree products only now and rediscovered the body shop last year. I'm using the rainforest shampoo and conditioner (firts used the moisture one, now using rainforest brilliance) and I really, really like it. at the moment im really enjoying using kerastase biotic shampoo (but need to switch to the different version as the "dry" is too much on the roots) with aussie lusciously long conditioner. my hair isn't frizzy but has defined waves, yess! I have been loving Pureology's moisture shampoo and conditioner, as well as Deva Curl's no-poo shampoo. It's for wavy/curly hair and has no lather to it. As a hairstylist, I always feel like using Pantene is a sin (ha ha)...but SO many of my clients seem to love it!! Wish they would bring it to America! I even contacted them to find out, no luck. Yes, I can be that obsessed. Trying out Sheer Blonde shampoo at the moment. I have dark dark hair. It's probably not doing anything, I can't tell yet, but meanwhile I like the way it rinses quite smooth. I try to use a more moisturizing conditioner to go with it. I've always bypassed Pantene and opted for other brands, namely Aussie and John Frieda. After your rave review though i may have to nip into Boots tomorow and buy it! Now I'm trying out the new Wella Pro Series and I love it! Plus it's really cheap too! I love Herbal Essences Hello Hydration (the blue one) - smells like coconut! I like the Garnier Fructis Pure Clean line. It makes my hair feel smooth, with no weigh-down, and it smells amazing. I'm always a little sceptical when I read PR-sponsored product reviews, but most of the time I'll take the blogger's reviews as genuine. I'm definitely more put off by sponsored posts on beauty blogs that have nothing to do with beauty/fashion/lifestyle, e.g. the Fanta sponsored post that was floating around a few weeks ago. These have been my go-to products for a few months, and I LOVE them. Most of the time my hair has a mind of its own, so it's nice to find an inexpensive product that manages to control my frizz! But when I'm feeling a bit more indulgent (or if I've been paid), I'll buy Aussie shampoo/conditioners. You are one of the only bloggers that I completely trust to review a product 100% honestly and for no ulterior motive. And I agree with you about passing on a product due to the PR element.....I've had 12 posts in the last fortnight about Eucerin in my google reader, a brand that I was thinking about trying out, now not so much. I might try the Redken line next for color treated hair. Right now I am using Kerastase Chromo line for color treated hair. I really like it, its concentrated so it lasts awhile. I also like Pureology Hydrate but the bottles are dreadful when you get low. I love the smell of all Pantene products, I haven't tried this one but while I was in Europe I wanted something cheap and easy so I used their line for damaged hair and it was quite good. I am always looking for something good for less money but I am so picky haha. LOreal EverPure just isn't Pureology Hydrate no matter how much I want it to be. Kerastase is close and the bottles are better but Hydrate does what you say you love, makes hair silky and smooth no need for straightening. i've just started using tresemme naturals shampoo and conditioner. i love it! I would have to say....AG peppermint wash shampoo paired with Redken Real Control hair masque conditioner is what I am loving right now. I absolutely love Daily Mirra-moisturizing! Just got it like a week ago but it makes my hair fill like silk! 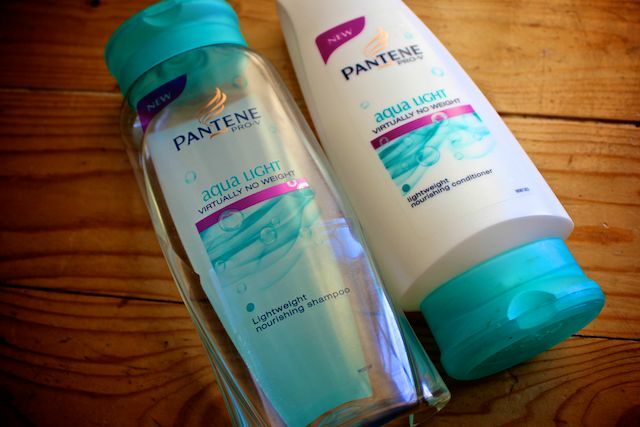 I used to love Pantene shampoos/conditioners but I found most of them weighed my hair down. Nice to know this one is lightweight!! I've got to try it! i use i love juicy shampoo by lush as i adore the smell very fruity. then i use any old conditioner just on the ends. but my favourite hair product is one ive bought for 10 years now and its the redken heavy cream, its a hair mask you can leave on as long as you like, it is the only mask that has never left that heavy feel or greasy feel on the hair, your just left with soft bouncy hair. I am currently using L'Oreal Light shampoo for oily hair. I had a problem - oily roots and dry ends and since I have super tick mid-length hair I searched for proper products to solve the problem. Went to a salon for Kerastase got very disappointed, then went to Fekkai - again disappointed, then to L'Oreal Professional - did nothing to my hair, until finally a simple, super cheap drugstore product changed everything. I combine the shampoo with a deep conditioner/mask every time I wash my hair and the results are fantastic! i love "what ever trevor" and the shampoo too! I'm using Pantene right now as well. I love it. I also use a deep cleaning shampoo once a week. It's just Neutrogena, but it does wonders! I bought this shampoo as a backup for when my Aussie Mega Shampoo runs out (HG hair shamperz!). Looking forward to using it now! I am a tigi addict!! Ive done the brunette, control freak, some like it hot and head shot. I buy the tweens and although their about £20 they last about 5/6 months. Headshot is amazing for dry hair and is great as a hair mask too...not forgetting they all smell unbelivable! I use the conditioner sometimes and I feel like my hair can go longer without being washed... My dove conditioner I use makes me hair look nicer but it gets greasier quicker... never found a conditioner that I have 'loved'. I am using this shampoo for the last 3 weeks,I have a sensitive scalp that reacts with any shampoo,even if it is silicon free,even the most expensive ones after 2 weeks give me massive white flakes,this one is been great so far,no dry bits and no itchiness,so to everyone out there with the same problem give it a go! I've tried it and i love it, it's just what u said..
My fave shampoo- and I have tried everything including Biolage, Kerastase, etc. The best one out there is Pantene Beautiful Lengths (Shine) and Khiels Olive Oil conditioner. Corres for damaged and coloured hair. I have been using this duo since December and I love it. It makes my hair feel soft and floaty especially as it can become quite heavy. Plus i found this duo to prolong my hair going greasy to quickly. I currently use Redken All Soft which I only buy (and stock up on) when it is on sale at Ulta. I have been wondering if Pantene can stand up to all of the hype. Thanks for the info...I think I will give it a chance!